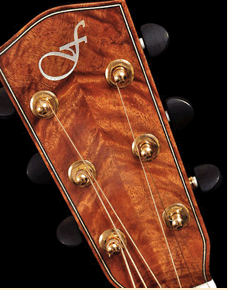 Fortenbery Guitar Company is a small one man business that builds handmade acoustic guitars. Jeff is passionate about what he does! That is – building handmade acoustic guitars. Because Jeff has never known two musicians that are just alike, he’s never built two guitars that are just alike. Each guitar is designed, built and voiced with a specific musician in mind. Jeff built a guitar and wanted some feedback before making final preparations to deliver it to a customer. So he brought it by for me to evaluate. I had three worship sets to complete that morning. So I played his guitar for about 15 minutes after the first set, then after the 2nd set I was able to play it for about an hour and fifteen minutes. At that point it was time for my last set. I took the stage again with my Taylor John Cephas Signature Model #63 of 100. I played the first chord and looked down in disappointment at my Taylor wondering why it didn’t feel, play and sound like the Fortenbery. In that moment I would have paid anything to have that guitar that was backstage……ON STAGE! Absolutely one of the best acoustic guitars I’ve played to date.